This school is aimed at people already using bioimage analysis professionally, and willing to go deeper in understanding and proficiency. Applicants should have basic knowledge of programming (Python or MATLAB or …). The focus of the trainings will be on deconstruction and automation of BioImage Analysis workflows, using as examples more than one toolbox and different exercises. In particular, we will focus on machine learning approaches The schools will be held in Luxembourg, 2-5th of Feb 2019, hosted by the Univ. Luxembourg. 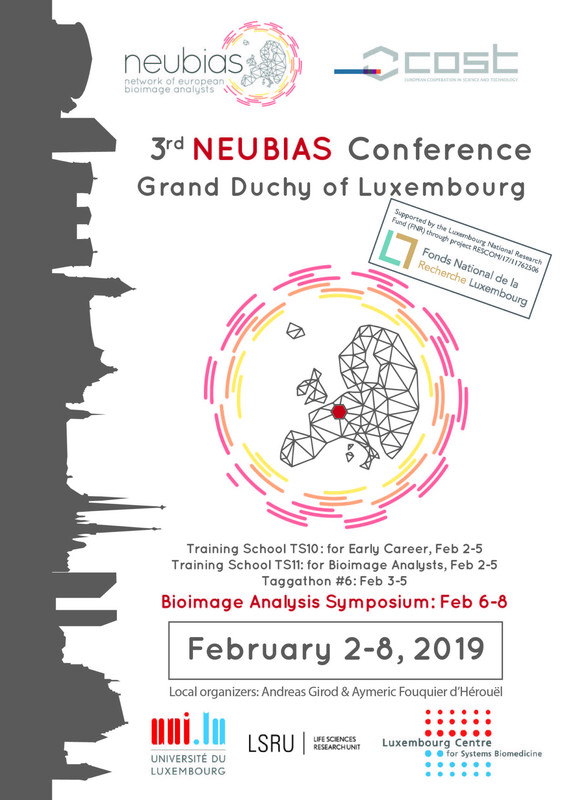 NEUBIAS schools are an excellent opportunity to learn from many experts in Bioimage Analysis (we are expecting >30 specialists at the event) and “…a great mix of intensive learning and community networking” (former trainee testimonial!). The schools will include practical sessions and seminars on ImageJ for analysis and publication, scripting/macros in ImageJ and other tools such as R, CellProfiler, Ilastik and session on ethics in image analysis and “work on own data”. Within the COST framework (funders of NEUBIAS), we will offer up to 7 travel grants per school to applicants who qualify. Registration requires a “letter of motivation” (filled in application form) and later a confirmation of status. Selection notification: Before the end of Nov.